IPenguin got a free Flash Destroyer PCB on Free PCB Sunday. He used sockets with the 7-segement displays so different colors can be swapped in later. There’s a build log with lots of photos in the forum. 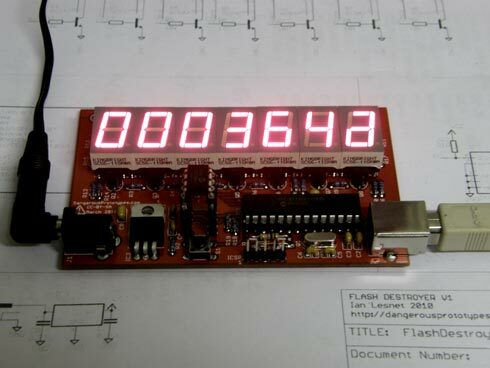 And now we have a second Flash_Destroyer sending a Microchip 24AA01-I/P EEPROM to the grave! Get free PCBs every Sunday, just ask for one on the free PCB post. The Flash Destroyer kit is available for $30, including worldwide shipping. This entry was posted on Monday, June 14th, 2010 at 9:17 am	and is filed under Flash Destroyer. You can follow any responses to this entry through the RSS 2.0 feed. You can skip to the end and leave a response. Pinging is currently not allowed.